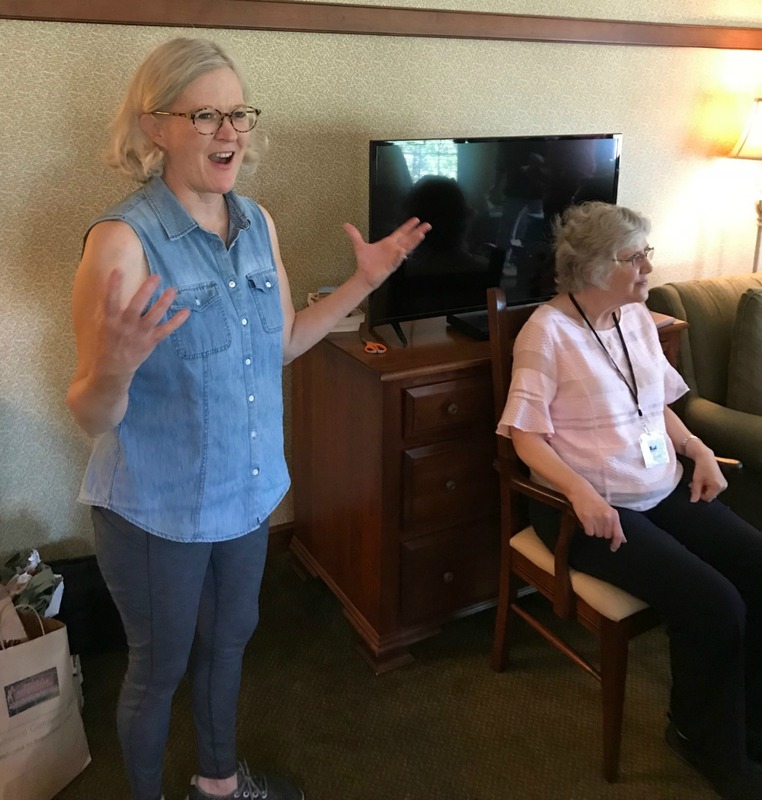 In June, I had the privilege of attending the Girlfriend Getaway in Sugarcreek, Ohio hosted by Amy Clipston and Shelley Shepard Gray. 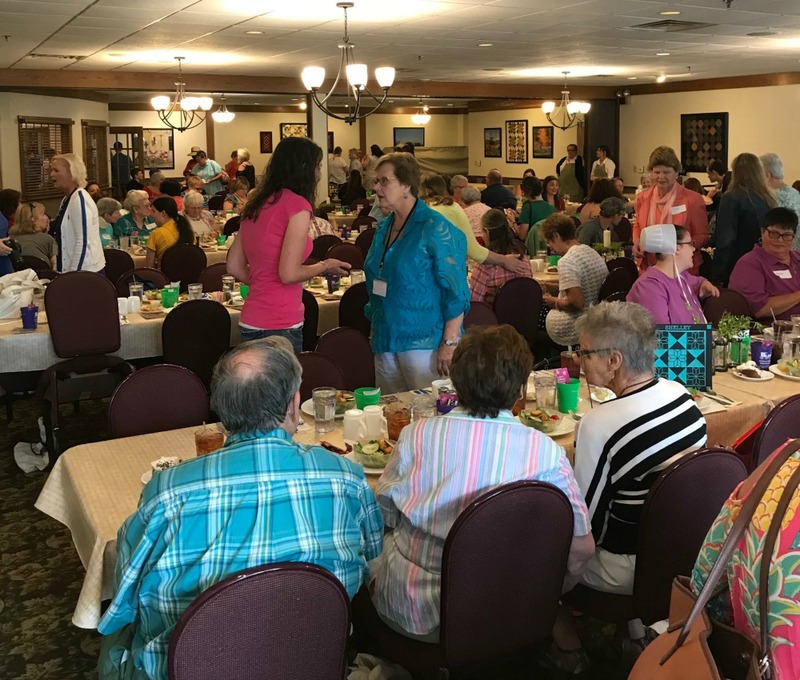 Eleven Amish authors and over 150 readers attended the getaway, and we had a blast. My husband was kind enough to come with me because I’m a nervous traveler. We flew into Columbus, rented a car, and drove the hour and forty minutes to Sugarcreek through some of the most beautiful country I’ve ever seen. 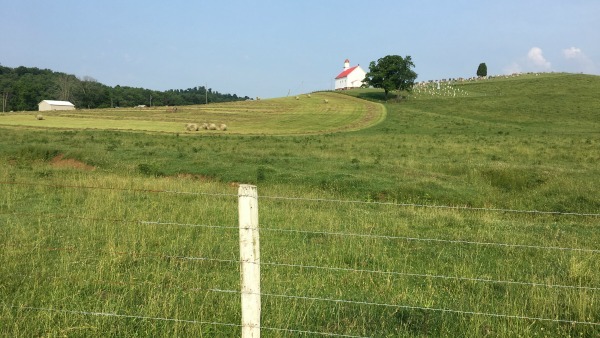 The rolling hills and lush farmland were surrounded by dense trees and stunning wildflowers. We had to stop and take a photo of this quaint little church outside of Sugarcreek. The Carlisle Inn at Sugarcreek is beautiful. 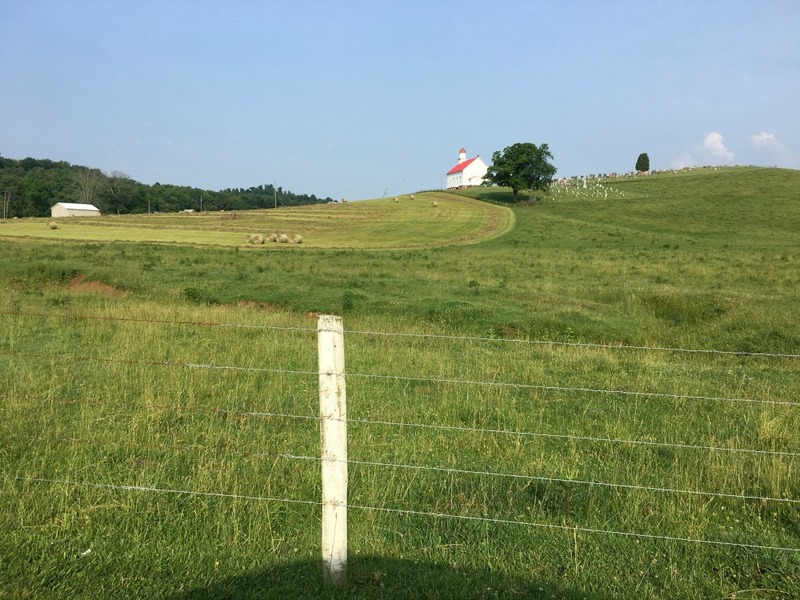 A country store, an Amish-themed restaurant, and a theater also sit on the property, but those few buildings seem to be in the middle of nowhere. The hotel features Amish handicrafts on the walls, a meeting room, and plenty of comfortable chairs to sit and visit with friends. It is truly charming, and I would recommend it to anyone looking for a fun place to stay. 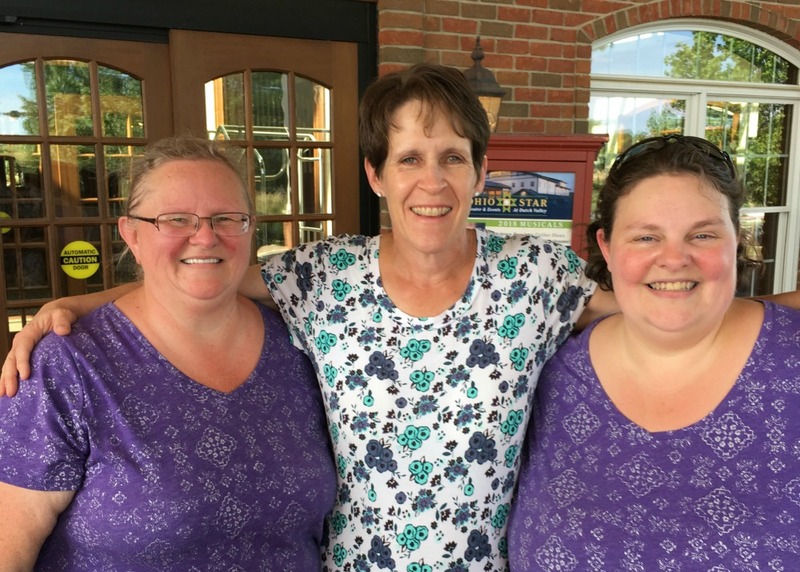 After we checked into the hotel, Gary and I ran into some of my favorite people, Rachel Miller and Donna Mynatt, who had just pulled into town for the event. Rachel and Donna are readers and authors and entirely delightful to be around. 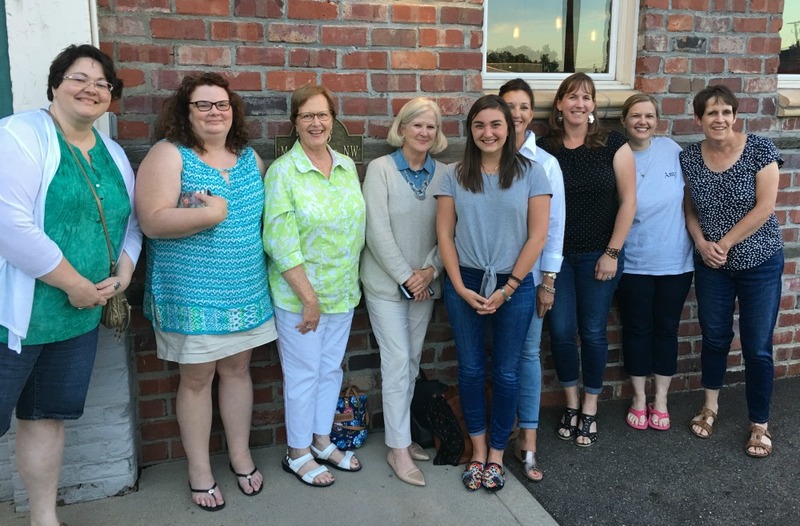 That night, we went to dinner with some of the other authors participating in the Girlfriend Getaway. Everyone in the group is so supportive and willing to share their writing and marketing experiences with me. Amish authors are like that. We truly want to see each other succeed. The next morning, my husband and I took a walk and soon realized that we were a hazard on the road since there were no sidewalks. We walked up a hill, past a family of geese, and into a cemetery where we did most of our walking. The gravestones were so interesting, and the cemetery overlooked a field of strawberries where a cute Amish family was picking berries. 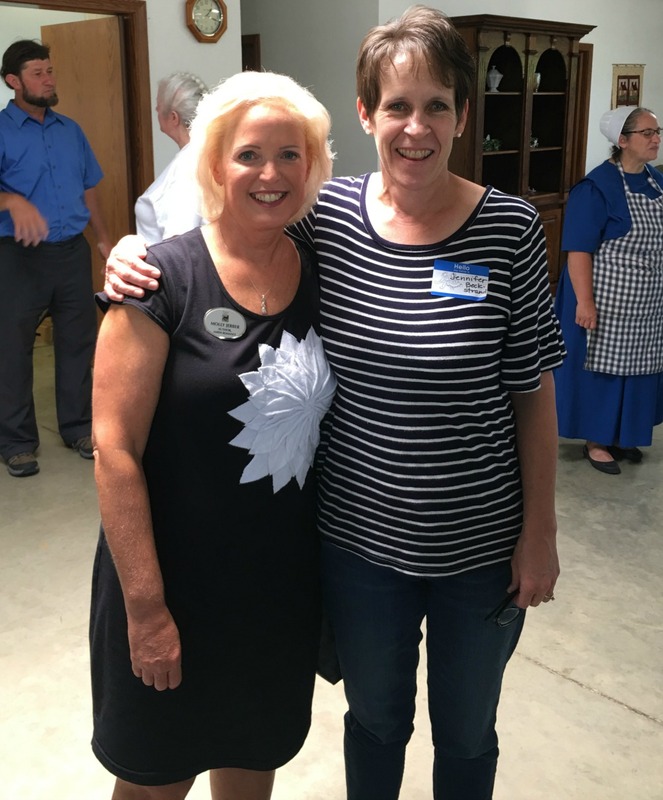 That afternoon, we met up with the Keeping Up with the Amish Facebook group members and had lunch at an Amish farm. 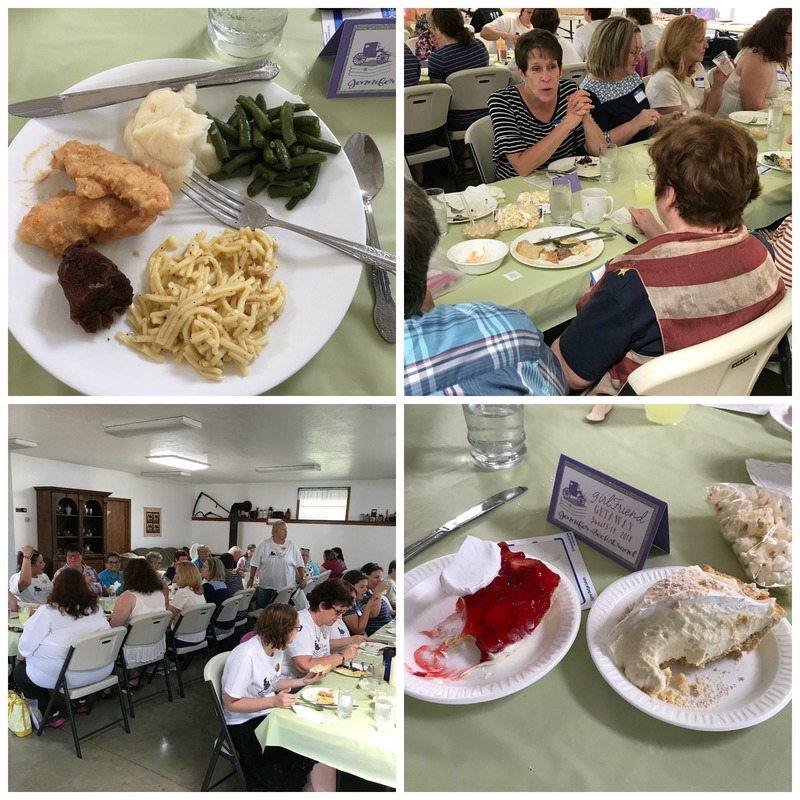 The food was traditional Amish fare, plentiful and delicious. I met some wonderful readers that day. Readers are what make this crazy writing business worthwhile. It’s so satisfying to know I make people happy with my books. I was also thrilled to meet Molly Jebber, whom I had never met in person before. Molly and I both have stories in Amish Brides, which came out in mass market paperback in May. It was nice to finally meet one of my writing partners. Molly is completely delightful, and I am so glad I got to know her! 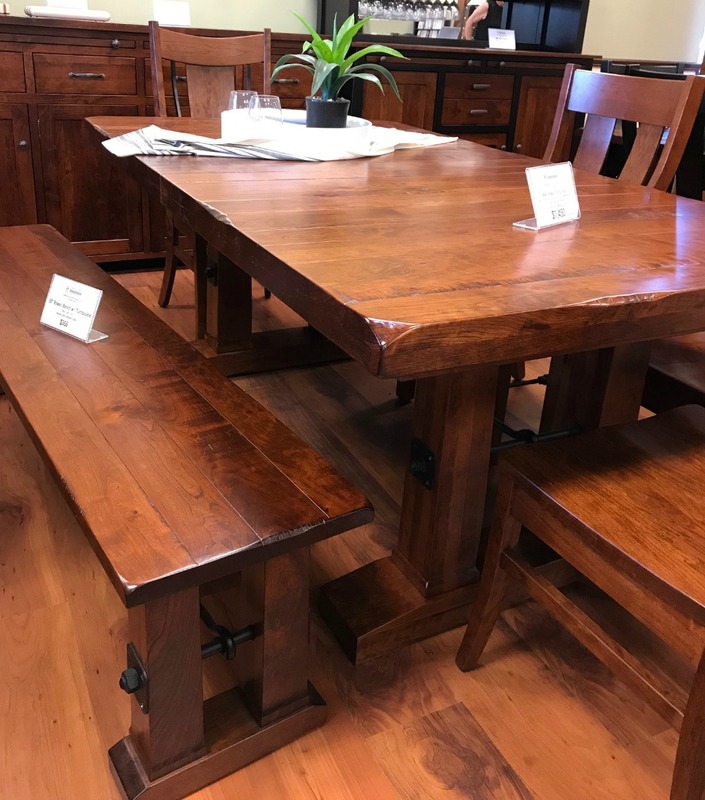 We had a few free hours and made the mistake of strolling into an Amish furniture shop. Of course, we were hooked within minutes and ended up buying a new kitchen table! It will be here in September. 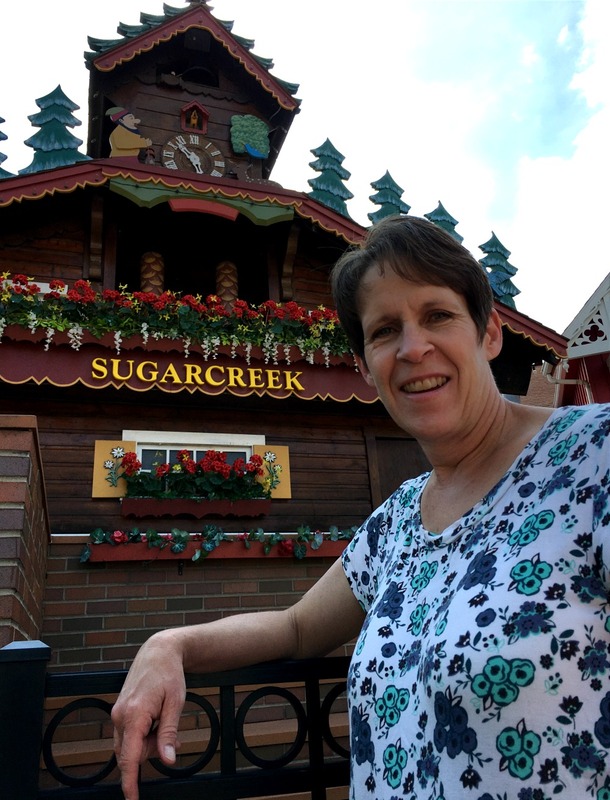 We also saw some other sights in Sugarcreek, like the world’s largest cuckoo clock, which was big but—don’t tell anyone—underwhelming. 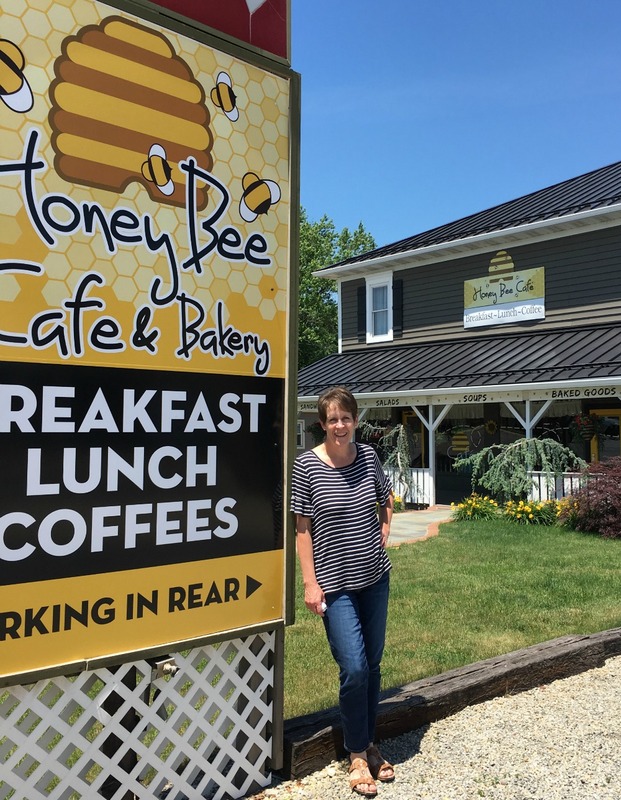 I couldn’t resist taking a picture next to this cute little café in Sugarcreek. The Honeybee Sisters definitely would have eaten here. 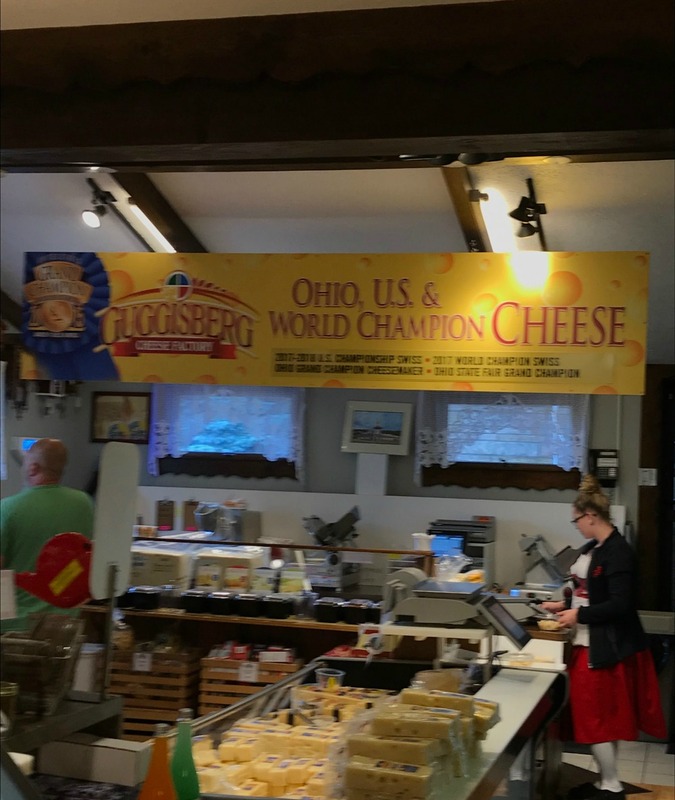 We also went to the Guggisberg Cheese store. It has the best Baby Swiss cheese I have ever tasted. I ate way too much. That evening we had a Bling-Your-Bonnet event where the authors and readers decorated baseball caps. My hat was mediocre, but some of those hats were spectacular. Saturday was the main event. 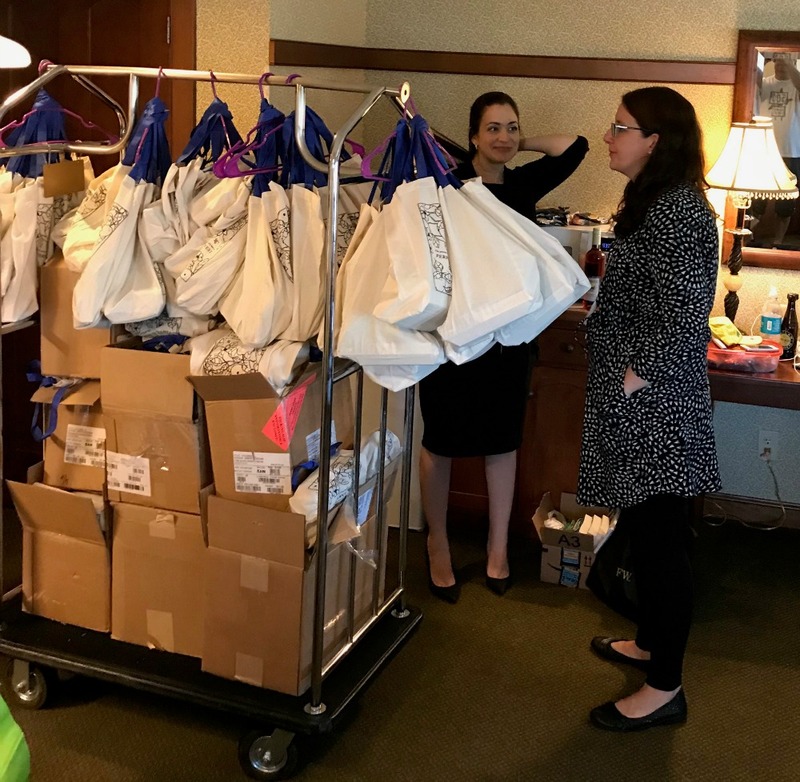 The authors stuffed goody bags before the luncheon. My husband was everyone’s favorite person because he was such a big help. I was the efficiency expert and had an impressive bag assembly line going. The luncheon itself was truly delightful. 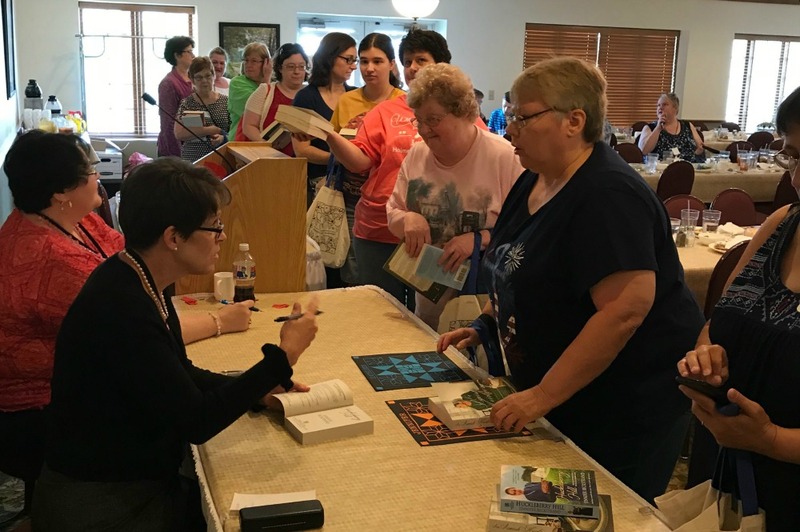 I met more readers as well as Shelley Shepard Gray’s Amish friends. Shelley and Amy Clipston gave inspiring speeches. I love my Amish author friends. What an amazing group of women! After the luncheon, the other authors and I signed books. I am so appreciative of everyone who came to the luncheon and said nice things to me about my books. There was even a Whoopie Pie Pam sighting! That evening we had a casual question and answer session in which I told my story about burning goat poop. 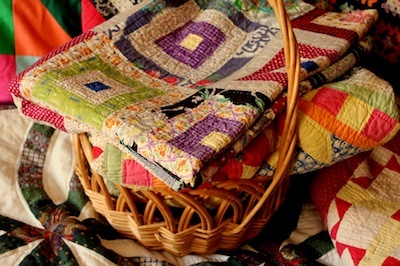 Once you’ve heard it, you’ll never read “An Amish Christmas Bakery” in the same way. Hmmm…I might have to post it again. 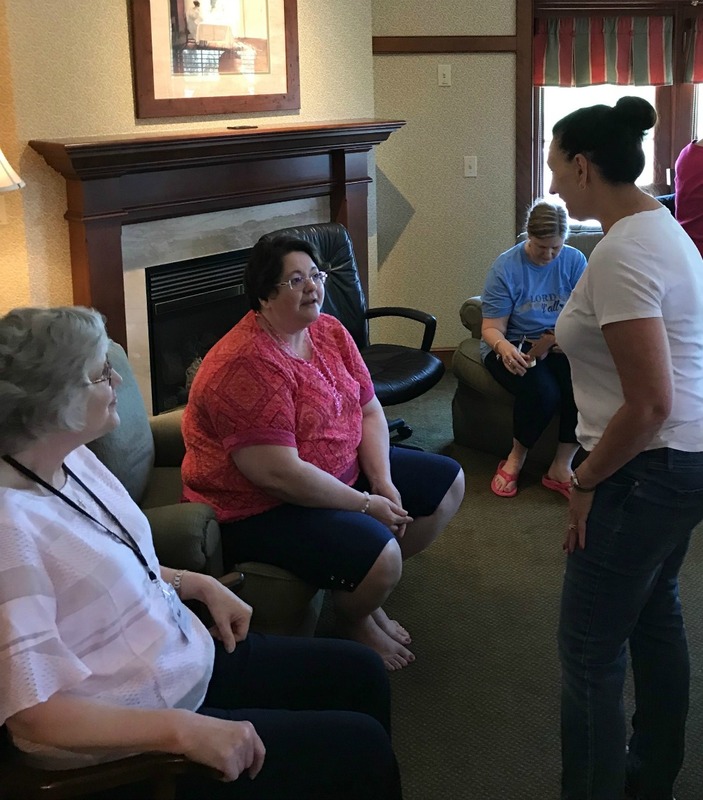 I had a wonderful time in Sugarcreek and hope to return soon! Stay tuned for a look into my visit to an Amish farm. Wish I could have come to see you all. Looks like it was a very good time for everyone. love all your pics and stories from your travels and book signings…great to see so many of my favorite people all in one place…since I don’t drive and can’t afford to go to all the activities….thank you for sharing the fun times! what is a whoopie pie pam?